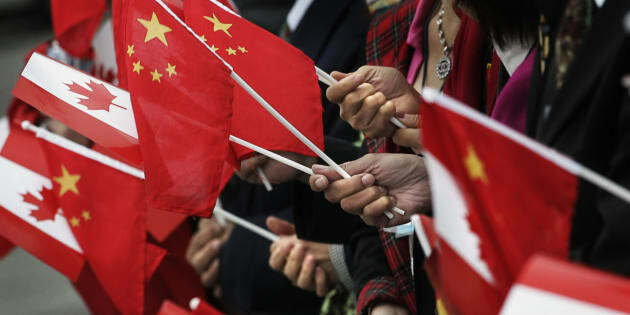 People gather holding Chinese and Canadian flags in Vancouver, B.C. As a practitioner of the social sciences, I was not surprised to see that Mandarin speakers have now surpassed Cantonese speakers in Canada. While expected, surprising was the speed of this development. I wrote previously that the Chinese market in Vancouver (and Canada) has been a 20-plus year phenomenon. Continued unabated, our country will surely become more Asian than it is now. But let me correct myself. It will be more Chinese. Already there is ample evidence of this influence, including language creep. On a recent visit to Vancouver General Hospital, bilingual advertising signs were prominently displayed in English and Chinese. And to keep cultural peace, the City of Richmond recently passed a by-law requiring all external signage to be both English and Chinese in response to complaints of Chinese-only signage. First, let me briefly explain the difference between Cantonese and Mandarin. Cantonese is a dialect whose denizens originate in Southern China, including Hong Kong. These early settlers to North America established the Chinatowns and the many accoutrements associated with these communities. Dim sum? That's Cantonese and what most North Americans associate as Chinese. Chinatown gate in downtown in downtown Vancouver. Mandarin is the official language of Mainland China. You might say Mandarin is Chinese. It's the spoken form of the Chinese government and state media, and what's taught in schools. It's likely what immigrants and visitors from China speak, or can speak. Beyond language, what's different about this new crop of consumers is, unlike previous generations of immigrants who arrived for reasons of family reunification, as labourers, or for political freedom, this new breed has arrived due to their economic freedom. Vancouver will solidify her place as the most Asian city on the continent. Whereby in the rest of Canada bilingual means English-French, in Vancouver it will mean English-Chinese. Surely, 20 years of continuous migration must represent a trend — one that is seeing recent acceleration. China is now the second largest contributor to tourism in Toronto and Vancouver. Today, 11 airlines operate 118 direct weekly flights between YVR and China (including Taiwan). That's triple since 2012 and doesn't account for Toronto and Montreal. Besides travellers, Canada continues to be a beacon for immigrants, with China leading the way in the last decade. But tourism and immigration tend to work hand-in-hand. With greater exposure by Chinese visitors to the wonders of Canada, led by Vancouver, the rate of settlement seems likely to persist. Toronto may be the most multicultural city in North America, but Vancouver will solidify her place as the most Asian city on the continent. Supported by its population and visitor base, its already plentiful and excellent Chinese and Asian cuisines, and natural attractiveness as a region, Vancouver will truly be a tribal city at the vanguard of a great and exciting social transformation. Already, the site of the most mixed marriages in Canada, we are at the beginning of a new cultural mash-up that will be its own unique derivation. Couple this with the protectionist Trump effect south of the border and the expected influx of youthful and energetic international students, and we will see Vancouver take on an Asian-ness all her own. People walk by a Scotiabank in Chinatown in Toronto, April 30, 2009. In Wolf Warrior 2, the recently crowned highest grossing Chinese movie of all time, the character played by Frank Grillo quips, "I underestimated the Chinese army." This can also be said of Chinese business as its meteoric rise has spanned less than a generation. While Chinese businesses and business people may be less mature, they are not any less capitalized. As a result, Vancouver is reaping the benefits of capital settling in the region. Predictably, real-estate development has been a beneficiary, but under the radar is a plethora of creative activity, from crowdfunding, to high tech, to virtual reality, to film and television, and more. Many of these businesses have raised money from Chinese investors and easily traverse between Canadian and Chinese cultures, serving as pan-Pacific conduits for the flow of capital, ideas, technology and commerce. Get ready for new mobile payment options like Alipay and WeChat Pay, in addition to the ubiquitous China UnionPay. Companies using these payment options will surely benefit as these methods draw cash from Chinese accounts, expanding the economy. Tied into immigration and travel from China, the prevalence and ease of these payment platforms characterize a new generation of Mandarin-speaking consumers. Plus, look for the resurgence of the QR code. Relegated to the dustbin in North America, China has embraced QR codes as a staple in communications, including payments. With this Mandarin-language announcement, Statistics Canada has confirmed it's a whole new world. In the last few years, our agency has seen in North America the emergence of the Chinese super app WeChat as it follows the migration of immigrants and travelers. We describe WeChat as Facebook on steroids only because it's the closest description we can muster. But WeChat is truly an ecosystem that allows communications, commerce, news, entertainment, media and much, much more. It may be the only app you need. By allowing wider and deeper connections worldwide, WeChat is singlehandedly forging a cultural thread that is defining the behaviours and lifestyle of Chinese everywhere. Western brands have always held allure for Chinese consumers, and through local populations in Canada, companies can leverage this segment as a way to leapfrog into China. This obviates the need for huge investment in China until necessary. Combine that with the chatter on WeChat, the Chinese diaspora's role as taste makers comes full circle. The success of Canada Goose is a great example of this.